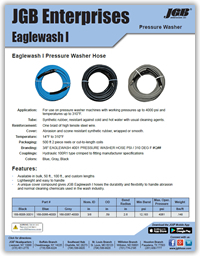 Eaglewash I Hose - JGB Private Brand - Hose by Vendor - JGB Enterprises, Inc.
JGB Eaglewash™ I Hose is specially designed for use on pressure washer machines with working pressures up to 4000 psi and temperatures up to 310°F. Abrasion and ozone resistant synthetic rubber, wrapped or smooth. A unique cover compound gives JGB Eaglewash I hoses the durability and flexibility to handle abrasion and normal cleaning chemicals used in the wash industry.